My father in law is staying with us and while going through some old pictures, we came across this one- we know the people but not sure where it was taken, most likely in New England. Anyone have an idea where this statue is or was? Thanks! 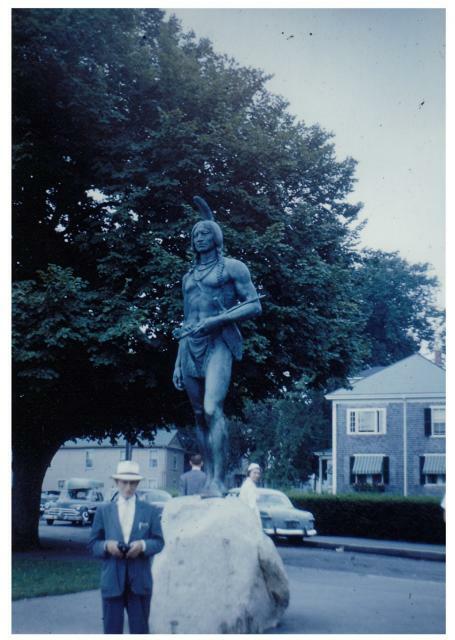 This is a statue of Massasoit, most likely in Plymouth MA. Reply, sure looks like that's it! Thanks so much! This group continually amazes me. When the question came up the other day at our house, I knew right where I was going to find the answer! Drag the pic you want to identify to the box on Google Images. My guess - 99% accurate. Try it with this picture. I knew that one! I have relatives in the area and we have visited that spot together. OK, for 200 points, what and where is this statue? Subject matter makes me think Ellis Island. ...Anyone have an idea where this statue is or was? Thanks! I'm pretty sure it's a statue of REWahoo. I think the statue is in Lithuania. For extra credit: The person in the hat might be me, but, I'm not completely certain of that. Bingo! The young lady is Annie Moore, the very first immigrant at Ellis Island. The statue is in Cobh (formerly known as Queenstown), Ireland, which was a departure port for many emigrant ships in the 19th century. It was also the last port of call of the Titanic. It was also where the survivors of the sinking of the Lusitania were taken. The statue dates from 1993 and apparently there is a similar one on Ellis Island. Bestwifeever and I certainly know our statues. Meadbh have you been to the Irish Famine memorial? Since returning from our Ireland trip, started reading The Great Hunger about the Irish immigration, what a sad story. I'm Lithuanian and I don't recall that being a statue of REWahoo. It could be if he was there before the Russians took the country over. Which one? There are more than 100 worldwide. I have been to a number of Famine mass graves, and also to the Heritage Centre at Skibbereen, Co. Cork, where there is an excellent exhibit. Of course I studied the history of the Famine in detail in school. I don't think one can understand Irish people without some historical background. Anyhow, sorry for the thread hijack. Back to our regularly scheduled statues! Here's one the locals know, but outside of Texas? That statue is about 50 (or more) feet tall along a freeway heading north to Huntsville, TX. You can see it from a long way off. Like they say, everything is bigger in Texas! Well, I think he might have been there at the time Genghis Khan invaded the territory.